I took my sons fishing at Big Bear Lake over the weekend. I have never been to Big Bear during the summer, and I don’t think I’ve ever been to the lake, so I wasn’t sure if we could fish from the shore or if we should rent a boat. When we got to the lake, we saw a bunch of people fishing from the north shore who had parked their cars on the side of the road. So, with my brand new fishing license in hand, we found a spot and started fishing. Unfortunately, we didn’t catch anything. Next time, I think we’ll rent a boat. I fished a lot with my dad when I was a kid, and I’ve taken my sons to a few lakes around the area and to the Balboa Pier, but I am definitely not a seasoned fisherman. My youngest son loves fishing, so I want to take him to all of the local (and hopefully some not so local) fishing spots. If there are any anglers out there who want to chime in with some tips for fishing Big Bear, Lake Perris, Diamond Valley, Corona Lake, etc., I’m all ears. We also stopped by Snow Valley on the way back down the mountain. 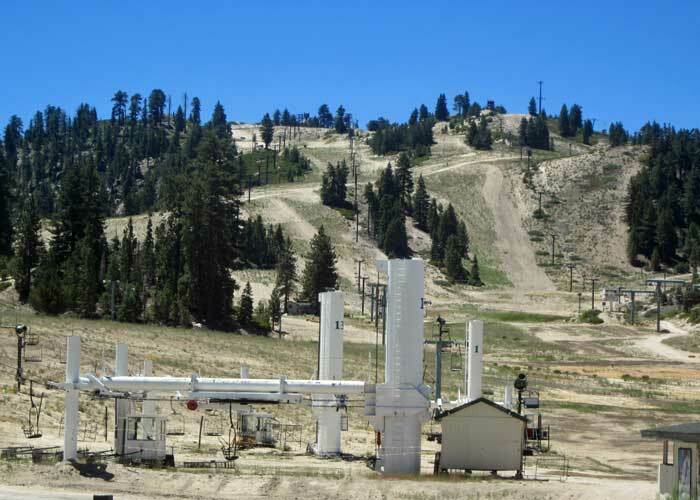 I used to ski at Snow Valley when I was younger, so it was kind of interesting to see the slopes without snow. I’ll have to bring the family back up during the winter and hit the slopes again. One of the nice things about living in Riverside is that we’re not too far away from the mountains or the beach.